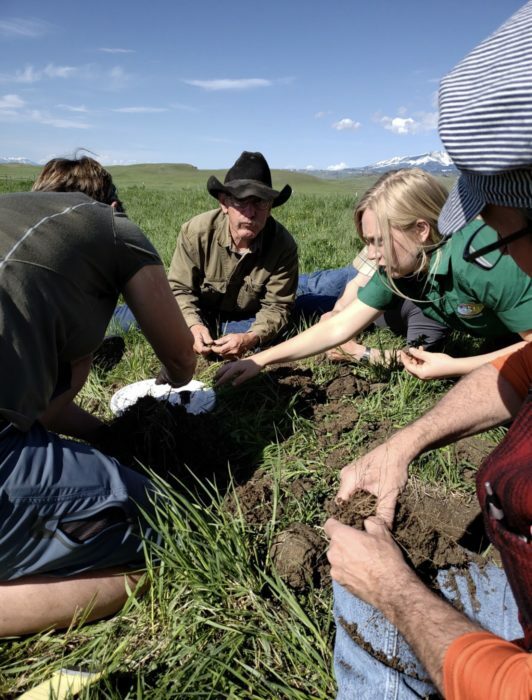 Kate Indreland and her dad, Roger Indreland, conduct a visual soil assessment (VSA) during a soil workshop held at their family ranch. The VSA is a baseline test to compare soils side by side. 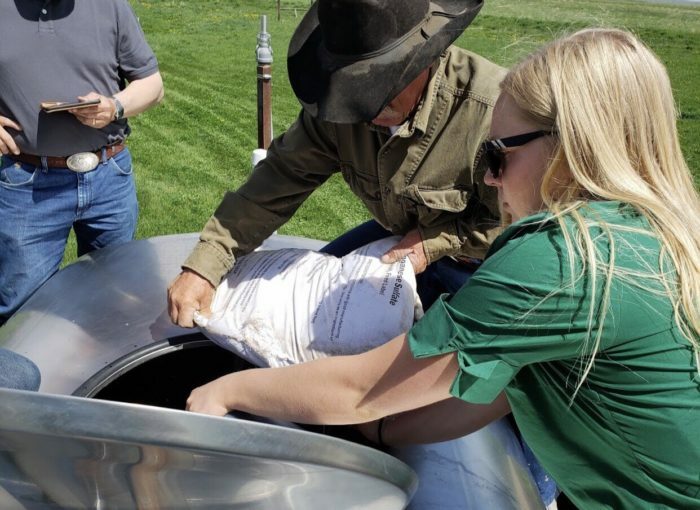 Kate Indreland and her dad, Roger Indreland, pour salt into a spray solution to add much-needed sodium into the mixture of fish hydrolysate and vermicast, which will benefit the soil in their fields. 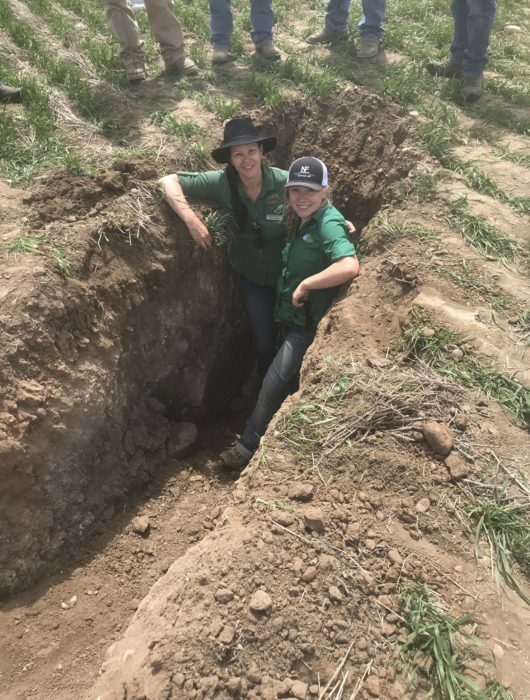 Kate Indreland, with agroecologist Nicole Masters (left), in a soil pit in Turner, Montana, examining wheat in a conventional operation to observe the hard pan tilling creates. 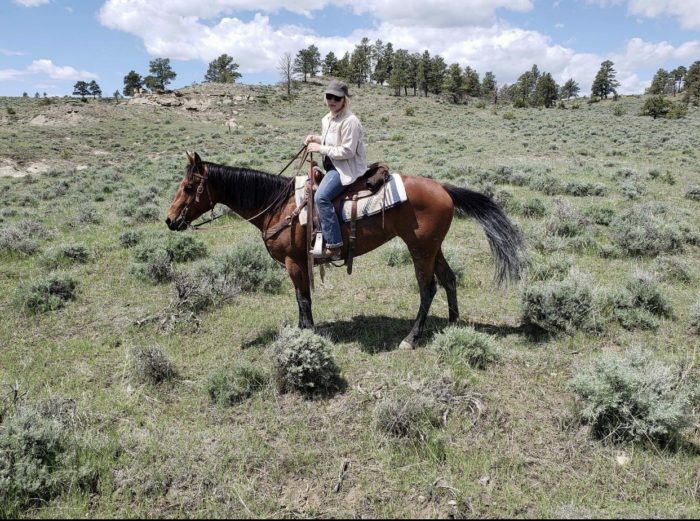 Kate Indreland and her horse, Penny, on a Montana ranch where they source vermicast. 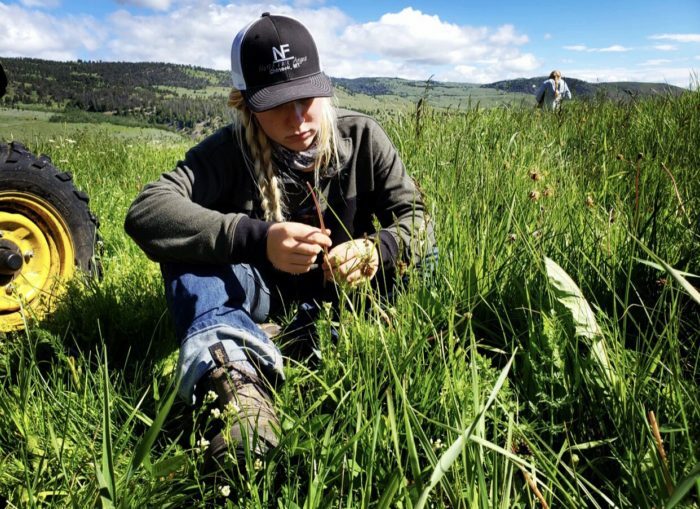 Kate Indreland studies the plant species growing in a rangeland field north of Yellowstone National Park, to narrow down what the soil might lack or be abundant in. 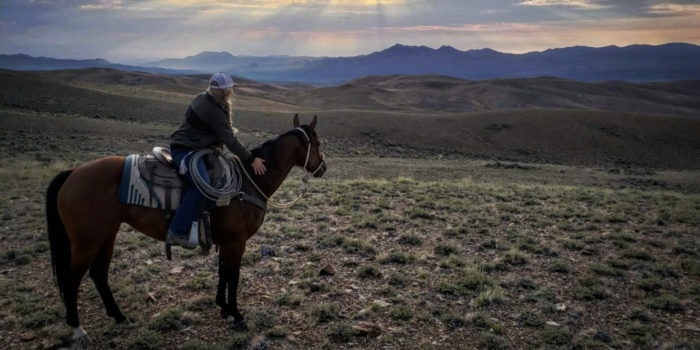 Kate Indreland from Big Timber, Montana, is featured in this post. She was a finalist in our inaugural General Mills Feeding Better Futures Scholars Program, which encourages youth ages 13-21 to nominate their in-action solution or idea that tackles one of the following topics: sustainable agriculture, food waste reduction and hunger relief. As a finalist, Indreland won $10,000 to further her soil health work. I had a chance to connect with her to see what she’s been up to since last summer. What did it mean to you to be a Feeding Better Futures finalist? To be chosen as a Feeding Better Futures finalist was rewarding and mind changing. It was such a changeup to have what my family does for a living to be recognized and valued by such a large player in the food industry. Being a part of this program has really given me the confidence to share these ideas with everyone interested. What inspired you to become passionate about soil health? I became passionate about soil when I realized it’s directly related to human health. When soil is healthy, so are plants and humans. When your soil is not healthy, it has the same chain reaction. Recently, I started to get into children’s health more specifically. The book, “What’s Making Our Children Sick,” by Michelle Perro, MD, and Vincanne Adams, PhD, really helped me understand more and begin to see a fix for a lot of gut issues we face today. Tell us about your family and what is raised on the ranch. My family raises registered Black Angus. My dad, Roger Indreland, started his small herd in high school as a Future Farmers of America (FFA) project. This has grown into a herd with a vision that provides genetics and services that help cattle producers attain more freedom and profitability in their business and life. I loved growing up in Montana and learning everything my family offered me. My dad and mom, Betsy Indreland, are some of the most open-minded people I know. They have really gifted me with this mindset; a mindset that let my parents dive head first into regenerative agriculture and a different way of doing things. How does regenerative agriculture help your cows? Regenerative agriculture helps build up the world we forget about right under our feet. An alfalfa root can go down almost fifty feet to source groundwater. Isn’t that insane? There is far more going on underground than above it. In a regenerative farming operation, one of the goals is to have nutrient-dense soil. Today, we are seeing the benefits of the practices my parents put in place decades ago. Our soil’s nutritional density that has increased steadily during this time has allowed us to run more livestock on the same acreage. Why is nutritionally-dense food important to feed the world? Nutritionally dense food is the way to feed the world. Can you imagine eating an apple or drinking a glass of milk and feeling full? Nutritionally dense food allows people and animals to get the same nutritional values without having to eat as much as before. This, combined with better managed agricultural and grazing lands, really offers a viable solution to feeding the world. How do you know when soil is healthy? There are many ways to know if soil is healthy. For starters, there are soil tests and animal nutrition, but my favorite is weeds. Healthy soils for one ranch may differ dramatically from her neighbor. It really depends on what you’re ranching or farming. It’s really encouraging to see improved animal health directly related to the increase of soil health. In a way, this encouragement creates a better mindset – health soil, healthy mind. I am currently going to school at the University of Montana, studying psychology with a minor in alternative energies and environmental sciences. I’m looking forward to using what I learn to help people understand and dive head first into all the possibilities this new era of agriculture offers. What is vermicast? According to The Urban Homestead: Your Guide to Self-Sufficient Living in the Heart of the City, Vermicast is the end-product of the breakdown of organic matter by earthworms. These castings have been shown to contain reduced levels of contaminants and a higher saturation of nutrients than the organic materials before vermicomposting. Vermicompost contains water-soluble nutrients and is an excellent, nutrient-rich organic fertilizer and soil conditioner. It is used in farming and small scale sustainable, organic farming. Learn more about vermicast, here. Learn more about Kate Indreland in this video. If you’re interested in learning more about the Feeding Better Futures program, visit FeedingBetterFutures.com. 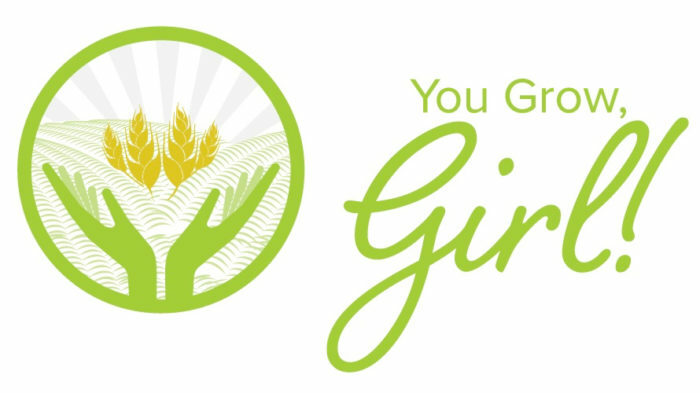 Please read our other You Grow, Girl! blog posts and learn more about General Mills in our 2018 Global Responsibility Report.